In Quebec, in order to look for or excavate wrecks you must have an archaeological research permit. Section 68 of the Cultural Heritage Act (R.S.Q., 2011, chap. 21, division VI, p.19) states, “No person may carry out excavations or surveys to find archaeological property or sites in or on an immovable without having previously obtained an archaeological research permit from the Minister […]”. 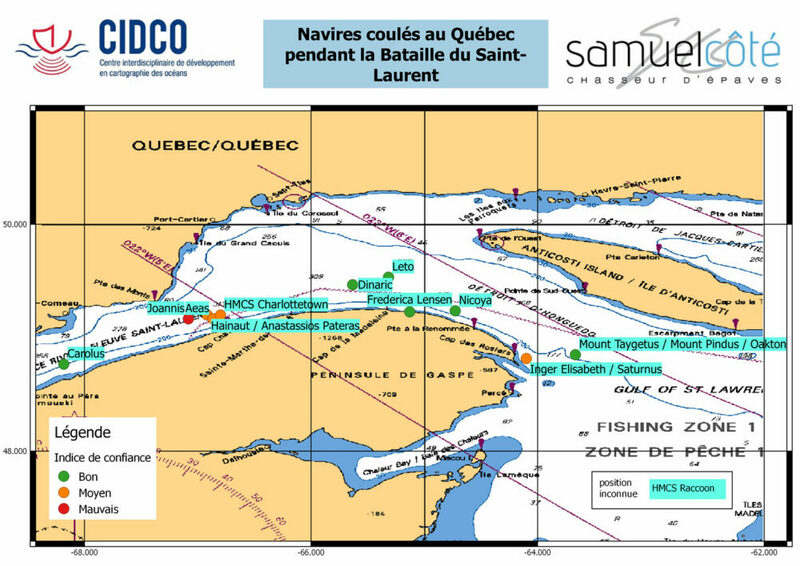 Thus, it is illegal to use geophysical detection methods and dive to locate wrecks without first obtaining a permit from the Quebec Ministry of Culture and Communications (MCC). AECOM’s Érik Phaneuf obtained the permit and accompanied our team in the field for this project. 1.2 What is a Wreck? From a legal standpoint, defining a wreck is quite a tricky affair. According to Transports Canada, “a wreck can be a ship or boat of any description, an aircraft, or a part of a ship, boat or airplane (e.g. cargo, stores, tackle); it can be any part of a ship, boat or aircraft that floats, sinks to the bottom or lands ashore; it can be cargo or the personal belongings of the crew or those shipwrecked persons” (Transports Canada, 2014). Wrecks can be given patrimonial titles. In Quebec, so-called patrimonial wrecks, which unofficially must be at least 50 years old, are not specifically mentioned in law, but are considered to be archaeological sites. The new Cultural Heritage Act (R.S.Q., 2011), which came into effect in 2013, defines “archaeological property” and “archaeological site” as “any property or site indicating prehistoric or historic human occupation”, and “heritage site” as “a place […], a land area that is of interest for its archaeological, architectural, artistic, emblematic, ethnological, historical, […]” (R.S.Q., 2011, chap. 1, p. 5-6). Furthermore, according to Section 48 of this same Act, “No person may, without the Minister’s authorization, alter, restore, repair, change in any way or demolish all or part of a classified heritage property […]” (R.S.Q., 2011, chap. 3, division IV, p. 15). Our legal responsibility does not end once a wreck has been located. In fact, locating a wreck is subject to provincial and federal legislation. A statutory declaration must be made to both levels of government. b) take any measures with respect to the wreck that the receiver of wreck directs, including delivering it to the receiver of wreck within the period specified by the receiver, or keeping it in their possession in accordance with the instructions of the receiver. Regarding the Provincial Government: Section 74 of the Cultural Heritage Act states that, “a person who discovers an archaeological property or site must inform the Minister of it without delay” (R.S.Q., 2011, chap. 3, division VI, p. 20). Section 202 of this same Act sets forth, “a person who does not immediately inform the Minister of the discovery of an archaeological property or site in accordance with section 74 […] is guilty of an offense and is liable, in the case of a natural person, to a fine of $2,000 to $30,000 and, in the case of a legal person, to a fine of $6,000 to $180,000 (R.S.Q., 2011, chap. 8, division 2, p. 46). 2.1 What are we looking for? Following extensive research, Samuel Côté identified 16 ships that were sunk in Quebec during the Battle of the St. Lawrence. Prior to our research mission, only three wrecks had been located. 2.2 Where should we look? The captain, when writing his attack report a couple of days later, perhaps logged the wrong position. In some cases, the ship drifted before sinking. The positions of the 16 ships were then mapped out and assigned a confidence index in terms of precision. 2.3 How can we choose? Despite the already-accomplished work, our research areas were still too vast. We therefore had to find further indicators to give us the best possible odds. Bathymetric data in the St. Lawrence River. A wreck on the seabed creates an unnatural landform. Topography of the seabed is called bathymetry. 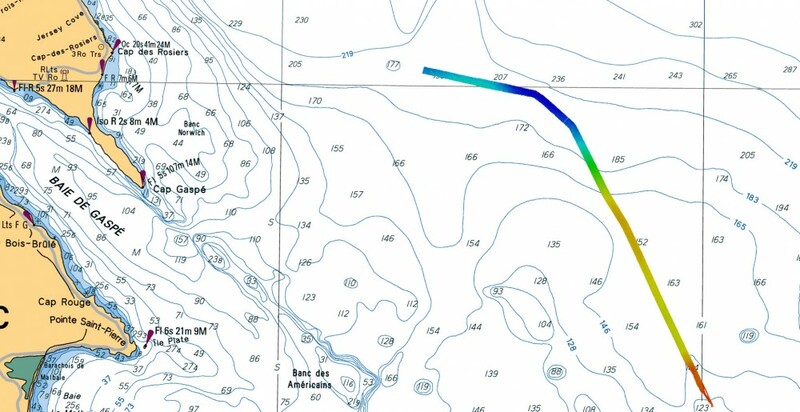 Thus, when a wreck is present there is a change in bathymetry. You can access bathymetries of much of our planet’s seabed through various tools, although the precision may vary. 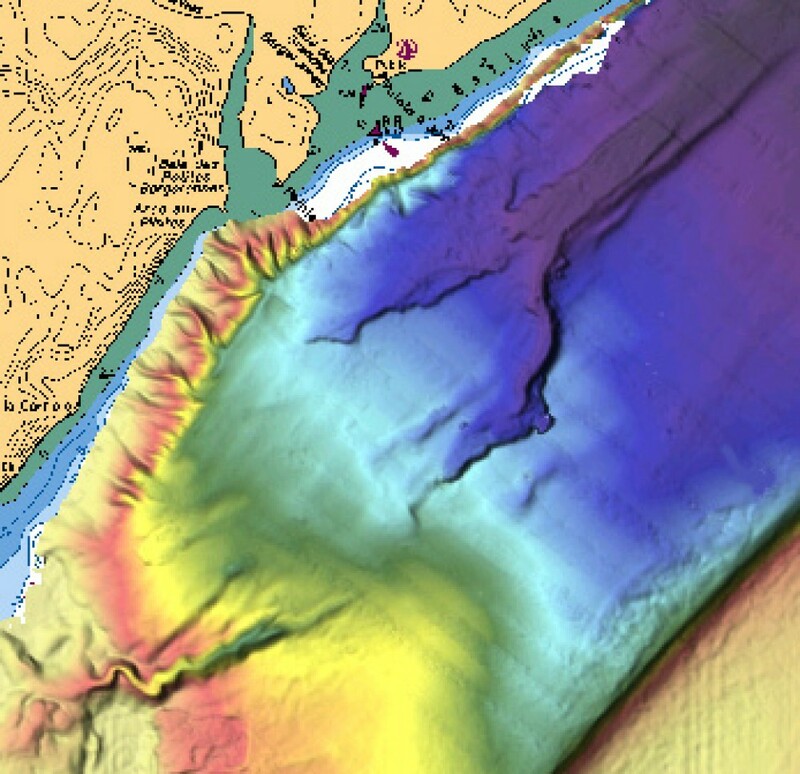 In Canada, you can access bathymetry data through the Canadian Hydrography Service (SHC). 500m resolution data is available at the following address. You can acquire higher resolution bathymetry data by requesting it from the SHC. Before heading off on our mission, we studied the SHC’s bathymetry data to see if we could find any shapes that could have been wrecks. After examining the data, we identified several targets. During our research, we noticed that some people who witnessed the Battle of the St. Lawrence remember having seen the sinking of the wrecks we were looking for. They very generously shared their memories with us. No one saw the Mount Taygetus, the Mount Pindus or the Oakton sinking, as they were too far from the shore. However, Cap-des-Rosiers inhabitants witnessed both the Inger Elisabeth and the Saturnus sinking. One witness, who was out on his barge fishing, recalls: “the first ship sank quickly and broke into two, it was at the front of the convoy. The second ship was in the middle of the convoy, it took longer to sink.” Another witness told us that you could see the two ships from the Cap-des-Rosiers lighthouse, and that explosions took place right in the middle of an area for fishing herring. At the time, depths were measured in line. Mr. Sainte-Croix told us his story in such a detailed way it seemed like it had only happened yesterday. Thanks to his testimony we can convert the local measurements into fathoms and metres. This precious information allowed us to refine our research areas and prioritize certain targets using bathymetry data. Once we had all the information we needed, we set out into the field to see what was underwater. We cannot see underwater like we can see on the ground. On the ground we perceive information through optical wavelengths. However, optical wavelengths do not travel well through water and so our field of vision is severely reduced. In order to perceive information across long distances underwater, you have to use acoustic wavelengths as, for example, marine mammals do. 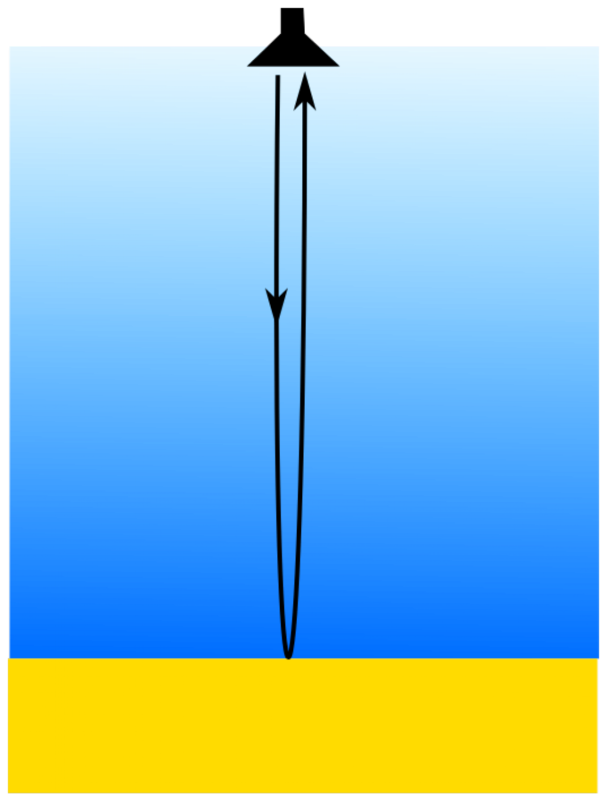 The overall rule for using acoustic wavelengths is simple: we send sound into the water, when it hits a target (the seabed, for example), the sound bounces back in the direction it came from. We calculate the time it takes for the sound to reach the target and return to us in order to obtain a distance and depth. 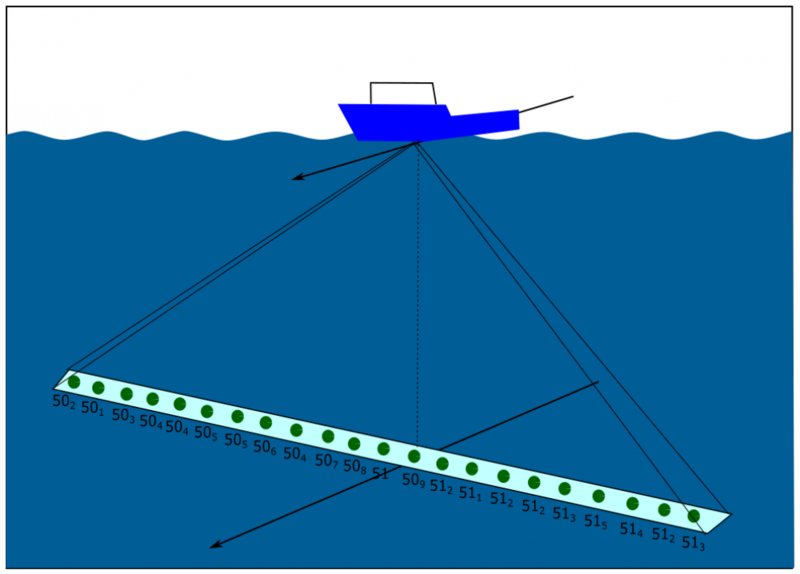 General rule for calculating depth using an echo sounder. The tool used to send and receive sound underwater is called an echo sounder. There are several different types of echo sounders, for our wreck location project we used a multibeam echo sounder. Multibeam echo sounders allow you to obtain depth measurement under and at the side of a boat while it’s moving. General rule for multibeam echo sounders. By passing over the area several times you can obtain depth measurements across the entire area. Thus, you can make out the shape on the seabed, i.e. 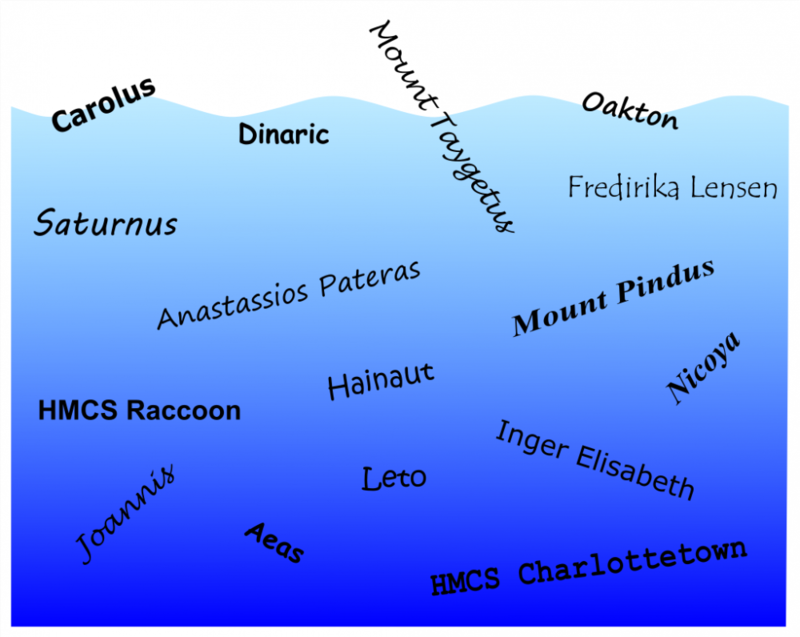 the bathymetry of the area, and recognize certain shapes, such as those that resemble shipwrecks. 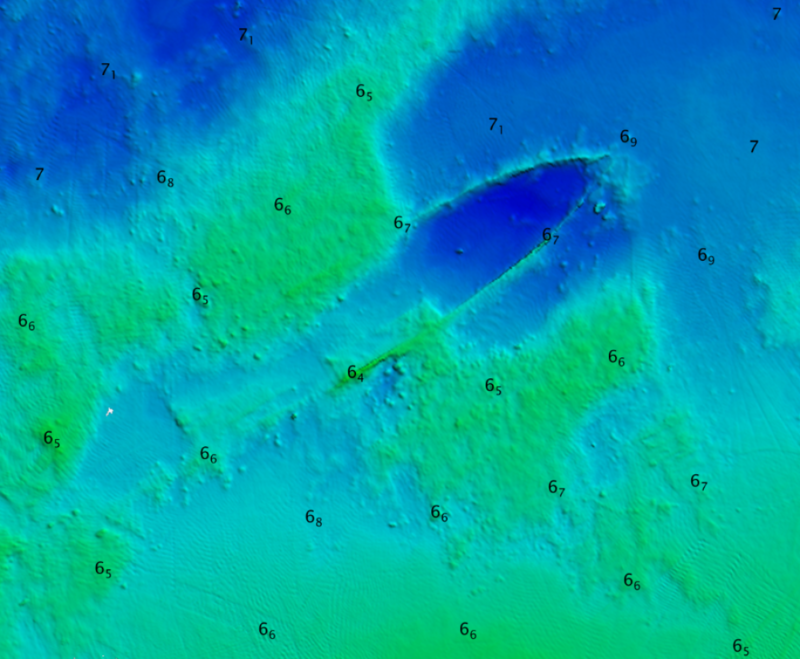 Numerical model of the area obtained with a multibeam echo sounder. 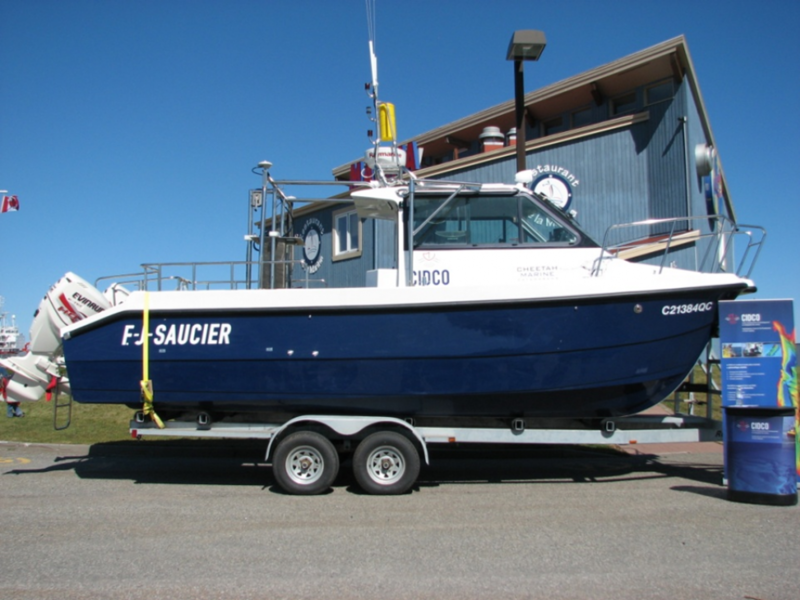 The F.J. Saucier, CIDCO’s surveying star. This boat can be deployed quickly and manoeuvre in shallow depths. It is 8.2-metres-long and has a 0.7 metre draft. 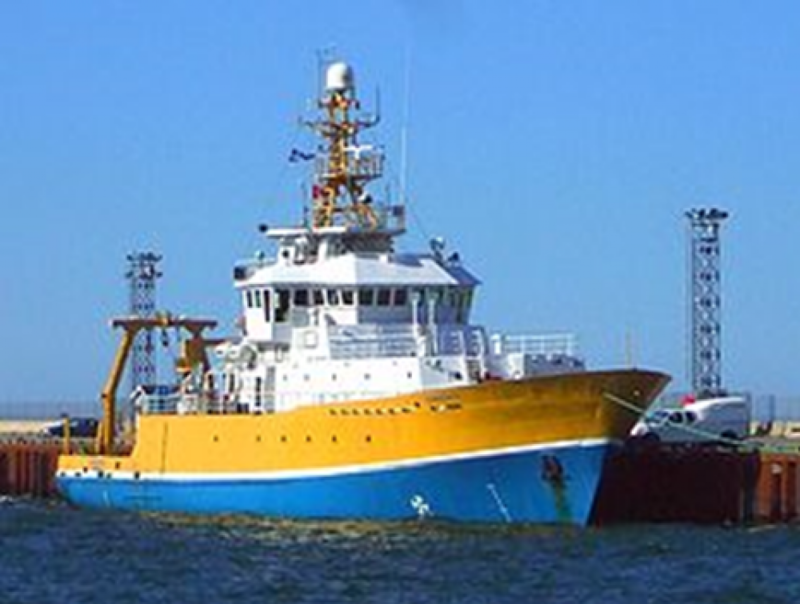 The Coriolis II, a Canadian oceanographic research ship that belongs to the REFORMAR consortium. We were able to use this ship to travel further away from the coast and thus carry out bathymetry at great depths. It is 50-metres-long and has a 5.2 metre draft. 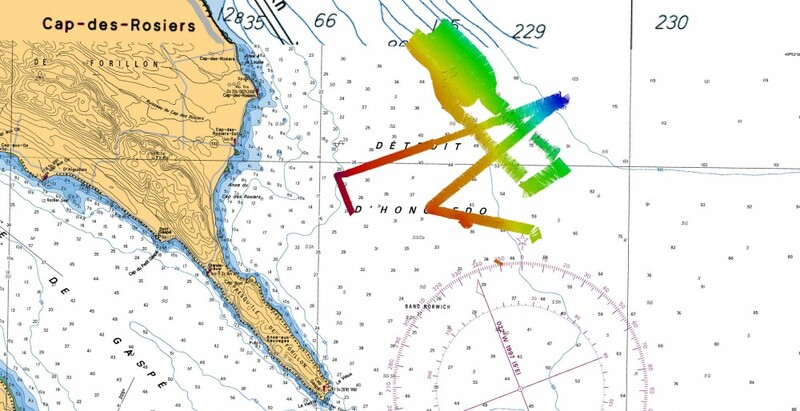 When we travel over an area using an echo sounder we say that we are insonifying the area. 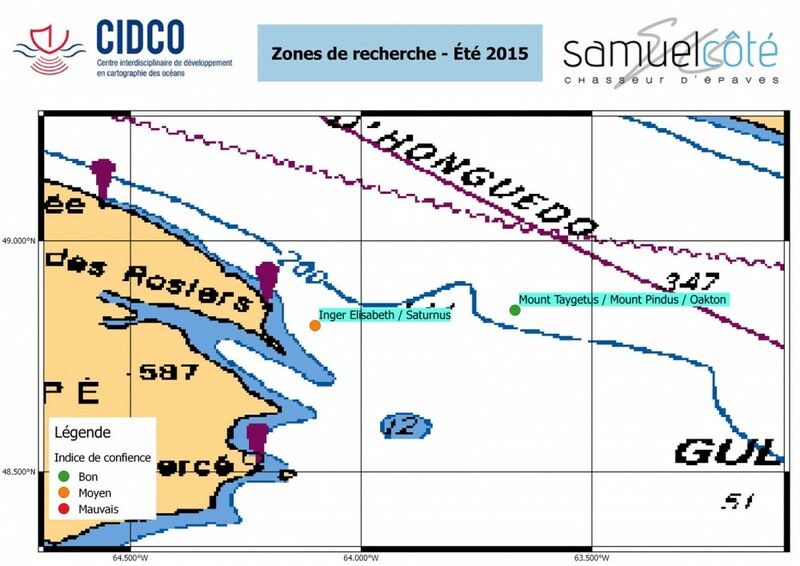 During this project, we spent three days at sea and insonified a total of 220 km2 of the seabed. Looking for the Inger Elisabeth and the Saturnus. Looking for the Mount Pindus, the Mount Taygetus and the Oakton. After our research mission, we returned home with tonnes of research we needed to analyze in order to confirm the discovery of wrecks. The first step was to clean the data in order to take out the non-pertinent information that was interfering with our analysis. Whenever we saw what we believed to be the shape of a wreck, we took its measurements to confirm whether or not it was. Measuring size using acoustic data. 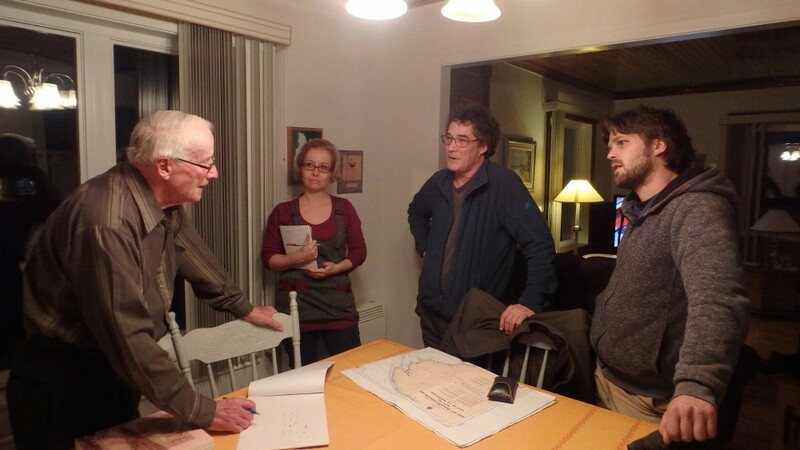 Once the CIDCO team finished their wreck data analysis, all of the information was transferred to Samuel Côté and Érik Phaneuf so they could identify the wreck and report it to the government. 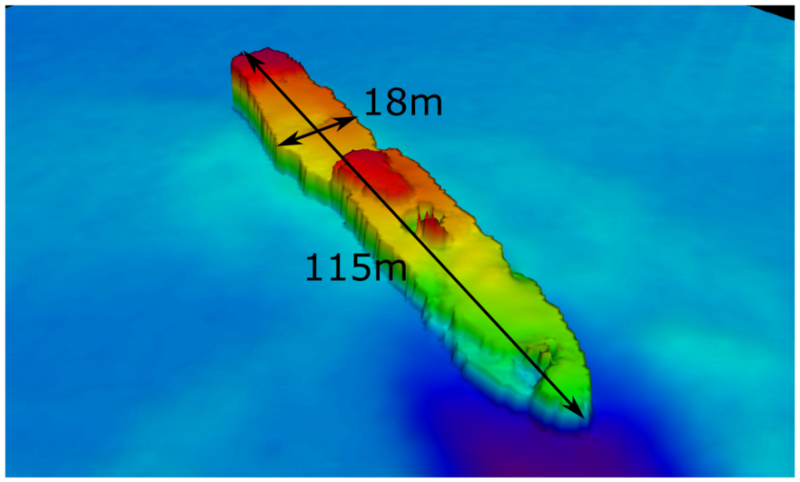 Bathymetry data provided us with sizes, it also allowed us to discover the current state of the wreck and to learn more about damages to the ship. Thus, by crosschecking this information with our bibliographic sources about the shipwreck, we were able to identify the wrecks.